A few years ago I was sitting around an evening campfire at the Oregon Country Fair in Veneta, just jawing with a few of the folks on my volunteer crew when, for some forgotten reason, I mentioned the Mudsharks in the course of my rambling. “What’s a Mudshark?” someone asked. “The Mudsharks were a Hoedad crew,” I told them, thinking that would be explanation enough for anybody, until the next question hit me. There was always something a bit tongue-in-cheek about the mighty, muddy Hoedads despite their dead-earnest approach to worker-ownership. They were a strange bunch—leftist radicals and “simple life” hippies with reforestation contracts that, over the years, amounted to several millions of dollars. But, considering that they planted trees for a living, the strangest part was that a very high percentage of the Hoedads had college degrees. Planting trees is the sort of mind-numbing stoop labor that most people go to college to avoid. Loggers shudder when they contemplate the rigors of tree planting. It is winter work, cold and wet and mud-spattered grubbing on steep mountain sides. It has always been done by those at the very lowest levels of the Northwest social order, hillbillies, drifters, derelicts, migrant farm workers, and illegal aliens. And yet, a survey of the Hoedads Inc. membership in the late 1970s found that planters with postgraduate degrees were more common among them than high school dropouts. Forty years ago, when a Lane County tree planting crew named itself after their quintessential planting tool, many young people believed, quite seriously, in creating a new approach to living. The “counterculture” it was called, and though it presented itself in forms that were shocking to their parents and to the House Un-American Activities Committee, it was, at heart, just an attempt to bring into the world a society that lived up to solidly American principles. Beneath the beards, beads, long hair, and odd forms of dress and speech, the hippies were merely young people who wanted to live according to the sorts of things they’d been brought up to cherish: freedom, equality, kindness, honesty—all the noble Sunday school and scouting values that, as children, they’d been taught to believe in, and which, they later discovered, were so very often either ignored or routinely violated in the conduct of our nation’s governance and business practices. When the old-time hippies spoke, you could almost hear the initial capital letters for certain words and phrases. They called themselves Freaks. They wanted to Expand Consciousness and to Live Authentically, outside of The System, without Working for The Man. They all understood these terms, all of which, I suppose, must seem quaint and a bit puzzling to their children and grandchildren nowadays. Two of the most common approaches to supporting yourself while living an honorable Alternative Lifestyle were starting your own small business and moving out of the city to a place out in the boondocks—Right Living and Back to the Land these notions, which became movements, were called. Unfortunately, meticulously making handicrafts on backwoods communes seldom paid well enough to feed a family. Other work was difficult to obtain because most of the bosses hated the hippies almost as much as the hippies hated having bosses. What little work could be had was mostly in doing the harsher forms of manual labor—picking fruit, bucking hay, cutting firewood, or planting trees—work that “respectable” folks left to society’s outcasts and outlaws. It was a youthful and romantic time. The Freaks were eager to cast themselves out and living outside of oppressive laws that they didn’t respect was only the righteous thing to do. Jerry Rust ’65 and John Sundquist got their first job planting trees in December of 1969. Rust had graduated from the University of Oregon with a degree in political science and, after serving a two-year stint in the Peace Corps, returned to Eugene and married Sidney Roscoe. Sundquist, a student at the UO honors college, wasn’t particularly interested in his course work. The two hired on with a reforestation contractor planting on Weyerhauser land up Fall Creek, earning $3.25 per hour. They worked for the contractor through the winter planting season and, having noticed the disparity between what they earned and what the contractor was receiving for their work, decided to bid their own contracts for the winter of 1970–71. With their friend John Corbin, they bid on a Bureau of Land Management contract for planting sixty-three acres on Humbug Mountain in the Coast Range near Port Orford. It didn’t go well. The land was steep, the weather bad, and living in a tent through the stormy coastal Oregon winter was even less fun than you might expect. However, the contract was completed and a second planting contract in the early spring went better. By the end of the season the worker-owner trio had earned $2,700 for five months worth of work. It wasn’t a princely sum, a good deal less than what they’d have made Working for The Man on a reforestation contractor’s crew, but for people who took pride in having dropped out of our money-mad society, it wasn’t bad either. And what could be better karma than planting trees? That summer they bid new contracts for the following winter season and expanded their partnership to eight worker-owners. The three had been calling themselves the Triads, but with more partners that became obsolete. Someone suggested naming themselves after their brutally efficient planting tool, the hoedad, and the name stuck. Each year brought more planters and more contracts. The first Hoedad crew grew to an ungainly fifty planters before dividing itself, amoeba like, into smaller, more workable groups. Shortly after the first stages of growth, the question came up of just how big the co-op could get and still be self-manageable by fully equal and fully engaged partners. One hundred? What if there were say, 200 or maybe even 500 worker-owners deciding things? A call for workers went out, crews were hastily formed and partially trained and sent out on big contracts. By 1974, in large part through the organizational efforts of Ed Wemple ’71, Hoedads had incorporated as a full-fledged cooperative and boasted nine crews. The total contract earnings during those first five years came to $2,395,491 in 2009 dollars. At their peak in the late 1970s, Hoedads Inc. had about 250 members and annual earnings over $6 million (adjusted) per year. With all of the joining and quitting, some 3,000 men and women worked as Hoedad partners over the co-op’s twenty-four-year lifespan. Of those 3,000 planters, many left the co-op voluntarily (some within just a day or two of hitting the slopes), but none of them were ever forced to quit. From time to time a Hoedad or two or three would show up on one of the company planting crews that I used to work on. They would plant for a couple of weeks or a month or two while in between their own co-op contracts. They were always good tree planters and good people to work with. There was an easy confidence about them, an air of amused invulnerability when dealing with the foreman. They came bearing subversive tales of fantastic earnings that were double or triple our wages. They joked a lot out on the units, teased every authority figure in sight, and when they’d leave we missed them. The Hoedads were real hippies. They weren’t television and movie hippies—all flowers and headbands and incense—but actual funky, fiercely independent, and often downright ornery Freaks, who were also idealistic and compassionate almost to a fault. They made many mistakes early on but learned and adjusted as they grew from a handful of unemployed friends to a large anarcho-syndicalist cooperative enterprise with an annual gross income that any hard-shell capitalist would envy. Developing ways of working together took a great deal of hard work in itself. It helped that there was money involved, since money provided a solid reason to organize. What helped the most though was compassion, the belief that everyone was truly equal and deserved to be treated as everyone else’s equal, not just in theory, but in fact. In large measure the co-op ran on respect as much, or more, than it did on manual labor and on money. Joy was always a big part of the Hoedad scene. Compassion does not merely lead to celebration, it demands it, and the Hoedads, if nothing else, knew how to celebrate. They were always ready to sit in a sweat lodge, soak in a hot spring, or skinny-dip in a creek at the drop of a pair of blue jeans. Whole hogs, kegs of beer, and hailstorms of killer-bud reefers disappeared at Hoedad crew end-of-season parties and the rising sun would reveal a flattened circle of meadow grass pounded flat and shiny by barefooted dancers. The 1976 Hoedads Inc. annual general meeting took place along the South Umpqua River, upriver from Tiller at the Johnny Springs teepee burner. It was summer and it was hot and so, naturally, their business meeting took place in the river and in the buff. Both large-scale corporate capitalism and bureaucratic socialism as practiced during the twentieth century lacked compassion, joy, and affection—the very things that make human life worth living. It was a remarkably inhumane century filled with massive crimes against humanity committed in the names of capitalism and socialism. East or West, left or right, both undermined what people have always treasured the most, humane and loving relations with each other and with the Earth. During the final days of the Union of Soviet Socialist Republics’ social and political congestive heart failure, there was a too-late promise of “socialism with a human face,” the lack of which had already brought the country to the brink of dissolution. In large measure, what the Hoedad experiment aimed at was developing a workable form of capitalism with a human face. In the process of earning their honest living, they helped change their world in many ways. One simple concept that the Hoedads helped introduce to reforestation was the notion of doing high-quality work, to ensure a high survival rate for the seedlings they planted. The contractors who dominated the field before the Hoedads had little or no interest in what happened to the land after they’d completed their contracts. “Jump in, blow it out, move on” was about the extent of their commitment. Planting was done on a piecework basis in a careless rush, skipping areas wherever possible and burying trees to increase the payments. Foresters were puzzled and a bit alarmed at first when the Hoedads started turning in excess trees after finishing a unit. Honesty just wasn’t part of the business before these hairy misfits arrived on the scene. Hoedad crews had about 25 percent women among their worker-owners, a novelty in what had been a strictly male world of reforestation. It had frankly never occurred to any one that a woman could plant trees efficiently or ever would consider it to begin with. Yet women came to Hoedads and they planted competently—sometimes while pregnant—and were seriously committed to supporting their fellow crew members. 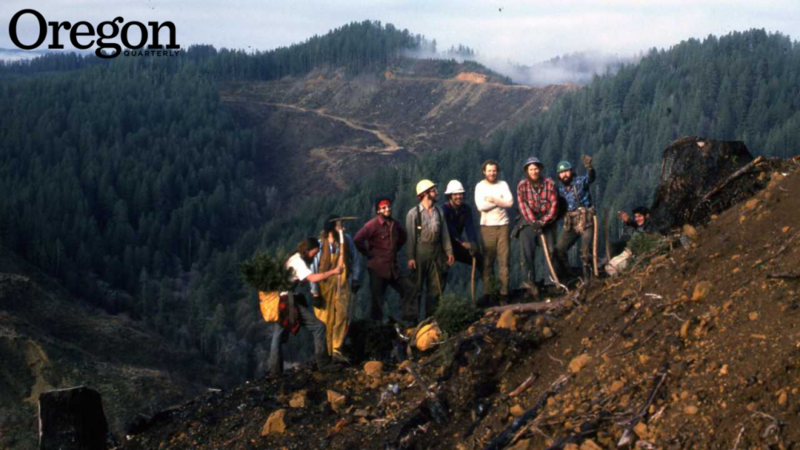 Hoedad crews planted trees, dug fire lines, thinned timber stands, built bridges and fences, and cut forest trails in every state west of the Rockies and in Canada, Alaska, and Hawaii. They also helped spawn other forest work cooperatives, lending their organizational know-how, start-up capital, and even temporary Hoedad membership to new co-ops. With economic success they became politically powerful. The Hoedads successfully fought the use of herbicides and pesticides in reforestation. When their members started getting sick from exposure to Thiram, a toxic chemical coating applied to seedling trees to discourage browsing by wildlife, they fought to have the substance banned for use on seedling trees. As a local political force, they hit their peak in 1976 with the election of Hoedad president Jerry Rust as Lane County commissioner, a post he held for the next twenty years. Eugene’s reputation as one of America’s most liberal cities, the equal of Berkeley, California, Ann Arbor, Michigan, and Madison, Wisconsin, owes much to the Hoedads. It is virtually impossible to name a Lane County countercultural institution that doesn’t, in some way, owe something to either Hoedads Inc. or to some Hoedads. The WOW Hall, Growers Market, Saturday Market, and the Oregon Country Fair all benefited from either Hoedad money or Hoedad expertise. Hoedad charitable giving was common, widespread, and generous to social and political activist groups. The heyday of the Hoedads lasted about a decade, roughly from 1974 to 1984. The early 1980s brought the “trickle-down” recession to the Northwest. Nationwide, the number of housing starts plummeted and with it the sale of lumber, which, in turn, meant less logging and less timber-cutting and therefore fewer acres of land in need of reforestation. The bidding for fewer and fewer contracts became much more competitive and the contracts themselves were generally for smaller acreages. Hoedads Inc. annual contract earnings dropped to about one-third of their prerecession levels. At the same time, many of the longtime members found themselves older and looking for work that involved less wear and tear on their aging bodies. Much of the original spirit died out with their departure. The attitude changed from that of comrades in subversion to something more like workers with a union hiring hall. By the early 1980s the co-op was debating the hiring of employees. The Hoedads eventually stopped doing reforestation altogether, took up construction work, and hired hourly-wage-earning employees. By then, most of the “old-timer” worker-owners had moved on to other co-ops or gone back to college and on to careers in medicine, real estate, teaching, and other ways of earning one’s keep that didn’t involve performing stoop labor on steep mountainsides. Following a large cost-overrun on a wooden bridge restoration contract, the board of directors of Hoedads Inc. voted to pull the plug on the co-op in 1994. Hoedads Inc. is gone now, but most of the Hoedads themselves remain among us. I always smile and relax upon finding that the person I’m talking to has planted trees for a living. It’s as if we’ve known each other for a long time and have so much that we don’t need to say to each other. Sometimes I think that tree planters are the only real people. Robert Leo Hielman lives in Myrtle Creek and is the author of Overstory Zero: Real Life in Timber Country. His last piece for Oregon Quarterly was “At the Zoo” (Spring 2010).